Back in April I wrote about visiting UnionDocs in Brooklyn and mentioned an independent project created by the Co-Directors of the UnionDocs Collaborative – Mapping Main Street. I’m an admirer of this collaborative documentary project which has set out to reflect the diverse realities of Main Street America, unsettle assumptions, and foster dialogue in and about community life. The four creators of MMS are a transdisciplinary group. Kara Oehler and Anne Heppermann are public radio producers, multimedia journalists and sound artists. Jesse Shapins is an urban media artist and theorist. James Burns is an economist, photographer, mathematician, who created the information architecture and data engine of the MMS website. Together they have significant experience and expertise in media production and public participation, informed by a conceptual framework that sees media as public domain and art as a tool for engaging “matters of common concern”. 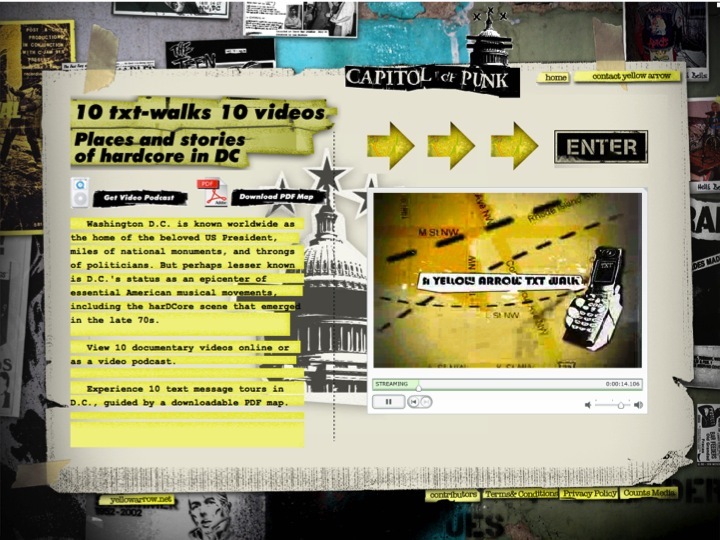 Jesse was one of the creators of the influential Yellow Arrow public art project, and Kara and he first worked together on the Yellow Arrow offshoot “Capitol of Punk”, a non-linear documentary mapping Washington’s music scene. Mapping Main Street was created as a response to the way that politicians were invoking Main Street to stand for “ordinary America” during the 2009 election campaign. This is hardly a new story, as Jesse noted in an article for “Writing Cities”, since the publication of Sinclair Lewis’s Main Street in 1920, “Main Street has been a highly contested shifting metaphor for what constitutes traditional American values and the “average” American experience.” MMS was designed as an intervention in this story through the co-creation and sharing of multiple representations of “these corridors of commerce and community” as seen from the streets themselves. The project kicked off in May 2009 with a 12,000 mile journey across the country to visit Main Streets and gather material, followed by promotion to the team’s networks and, through a National Public Radio series, to the wider public. Audio stories with stills made by the team act as seed content to inspire and encourage contributions that are posted on Flickr and Vimeo, and drawn in to the MMS website using public APIs. The aspiration is to document all of the streets named Main in the USA, and to date there’s content from 591. I’ve been keen to talk to the MMS team and recently hooked up with Jesse and Kara on skype for a phone interview which you can read here. The interview covers important fundamentals of collaborative participatory work – the role of the producer in “designing frameworks that have very specific constraints” (my italics – I think this is key), the relationship between professionally produced and citizen content, the challenge of how to structure a good user-experience from a “gigantic database”- a challenge met by the MMS team through what they call, “algorithmic curation”. An attitude to the database as a creative opportunity for reflecting a non-linear, multi-vocal aesthetic is an exciting aspect of the thinking behind MMS. “What the database enables in the context of public media arts is open-ended, indeterminacy. Instead of simply representing a singular thesis, the database allows for multiplicity… a framework that brings together multiple voices and multiple media formats. “ (From a presentation by Jesse & Kara to the Northeastern School of Architecture Feb’10). The team plans to share this approach through the development of Zeega, an open-source toolkit for the creation of API-driven interactive documentaries, which is high on the agenda of a new organisation they’ve set up, the non-profit Media And Place (MAP) Productions. Something we didn’t touch on in the interview is the appeal of Main Street as subject matter. In a presentation by Kara, James and Jesse at the Berkman Center for Internet & Society at Harvard (which is well worth watching), Kara says that when she records vox pops on the street usually only one in three people will be prepared to talk, but on this theme everyone wants to talk! This reminded me of how eager people were to talk about Voices, a project about accent and dialogue that I was involved in at the BBC, and it’s interesting to think about why some topics engage in that way. On Voices it seemed that people had a confidence, a sense of ownership of the subject – we are all, after all, experts in our own linguistic usage. Many also wanted to weigh in about the issues of class and power that play out around language (at least in the UK). The subject was also emotionally resonant – it seemed to me because language is so linked to where we have come from – both geographically, but also in the oedipal sense. Main Street is similarly resonant, layered and contested thematic territory, and as such fertile ground for participation and debate. Getting the subject matter right is clearly important to any media project but it’s critical for a participatory project which needs to matter and to be accessible for people to want to get involved. That’s happening on MMS, with educators in particular picking up the topic and facilitating local initiatives around it. Main Street is a great subject, and Mapping Main Street is doing important work with it – engaging a dialogue about the lived experience of this site of “common concern”.